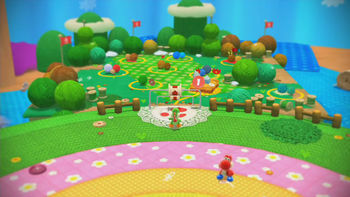 World 1 is the first world in Yoshi's Woolly World. It is a grassy plain with small forests. This world has nine levels: eight compulsory, and one optional special level unlocked after collecting all 40 Smiley Flowers for the world. Completing this world unlocks World 2. Yarn Yoshi Takes Shape! A tutorial style level with many Shy Guys and Piranha Plants. Bounceabout Woods A level with bouncy platforms and trees. Sponge Cave Spelunking A cave level with many Nipper Plants. Big Montgomery's Fort A fortress level where Big Montgomery is fought. Knitty-Knotty Windmill Hill A level with small caves and many windmills. Shy But Deadly A level with varied Shy Guys and many logs. Clawdaddy Beach A beach level with many Clawdaddies and Watermelons. 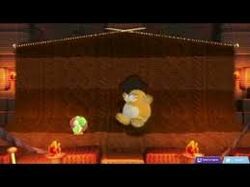 Burt the Bashful's Castle A castle level with Keys and the first boss, Burt the Bashful. Hang Tongue! A night-time beach level with waterfalls and many Shy Guys. This page was last edited on September 15, 2018, at 17:36.